AIR SOURCE HEAT PUMPS How do air source heat pumps work? Air source heat pumps absorb the heat from the outside air even during temperatures as low -15°C. The heat is then transferred throughout your premises or home providing heating and/or hot water. Using the outside air heat pump systems are a naturally sustainable energy source only using a very minimal amount of electricity to run on. Once the heat is absorbed from the environment it is transferred into a liquid which then passes through a compressor component where the temperature is increased. Once the liquid is heated to a higher temperature it is then passed to the heating and water systems providing heating and hot water. We provide free initial site surveys and quotations during which we will visit your property and assess which system would best suit your needs. Our goal is always to provide a heat pump system designed specifically to meet the requirements of the customer. 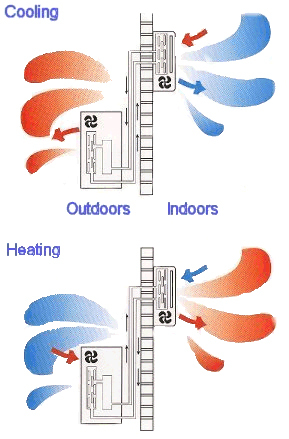 Air to air heat pump systems produce warm air which is circulated throughout the premises by fans. Air to Air systems are generally not recommended for heating hot water. Air to water heat pump systems transfer heat from the outside air into a liquid which is then sent through your central heating system. Heat pumps work efficiently at lower temperatures than standard boilers making this system very suitable for underfloor heating systems or property with larger than standard radiators - Systems which give out a lower average temperature for longer periods of time. Air source heat pump systems can help you to decrease your energy bills and lower carbon emissions (dependant upon the fuel source you replace). They require a minimal amount of maintenance to upkeep and can provide both heating and hot water to your home or business. Our fully certified and qualified team are committed to ensuring all our customers needs are met offering a highly skilled, professional, efficient and cost effective service tailored to your individual needs. And you can rest assured that all work is fully guaranteed.